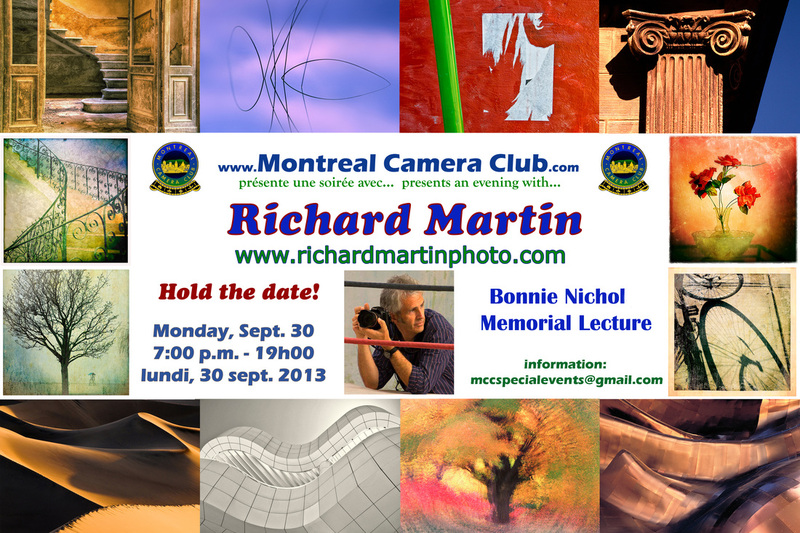 The MCC is proud to have Richard Martin as the first presenter in what will become an annual lecture in honour of the many important contributions made by our dedicated and long-time member Bonnie Nichol, Editor of the Cameragam, who passed away in January 2013. Richard will share many of his outstanding images, as well as tips on how you can improve your photography. Whether you are a beginner or a pro – everyone will learn something! Thanks to the generosity of Ron Nichol, the evening is free for MCC members. Space is limited – don’t wait to reserve your spot. A long-time contributor to Photo Life, Richard pursues photography as a medium of visual expression. He is best known for his unique vision and a personal style characterized by a strong sense of composition, colour and the use of light—combining an architectural love of geometry, pattern and texture with a painter’s sensitivity to colour and composition. Well known for sharing his enthusiasm, creative vision and passion for the medium, Richard continues to inspire participants with his annual photography and visual design workshops in his native Kingston, Ontario since 1990. He also conducts workshops, tours, and seminars around the world. Saturday, September 28th – 8:30 a.m. to 5:00 p.m.
Sunday, September 29th – 8:30 a.m. to 5:00 p.m.
Space is limited – Registration for Club Members until August 30th. All workshops and presentations will be given in English, rain or shine, and may be subject to change. Lunch is included in the price of the workshop. A long time contributor to Photo Life magazine, Richard pursues photography as a medium of visual expression. 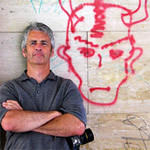 Well known for sharing his enthusiasm, creative vision and passion for the medium, Richard has been leading annual workshops on photography and visual design in his native Kingston, Ontario for fourteen years. He also teaches workshops and seminars across the country, including Seattle, San Francisco, Vancouver, Toronto and Montreal. Widely exhibited in both public and commercial galleries, including the Agnes Etherington Art Gallery of Queen ’s University, Canadian Museum of Contemporary Art and The Silver Light Gallery in Carmel California. He began making photographs in 1976 as a hobby, which paralleled his profession in architecture. In 1990 Richard made photography his full time pursuit. He is best known for his unique vision of the natural world, with a personal style characterized by a strong sense of composition, colour and the use of light - combining an architectural love of geometry, pattern and texture with a painter's sensitivity to colour, light and composition. Images by Richard Martin have appeared in numerous periodicals, with portfolios, essays and articles published in Camera Canada, Photo Digest, Photo Selection, Photo Life, Best of Photography Annual, Wood Le Bois, Wood Design & Building, Canadian Interiors and Queen’s Quarterly. He is currently contributing editor for Photo Life Magazine. My photography is a celebration of the visual world. As my individual photographic style emerged, I developed a fascination with linear structure and texture. I began seeing line and shape in a highly graphic way, and gained an appreciation for the dramatic effects of light and shadow on form. One of the unique properties of photography is its spontaneity, its ability to capture a transient moment. A moment of discovery becomes a moment of rediscovery when the subject is viewed through the lens. In this way photography becomes a simultaneous act of intuition, feeling and recording. The quality of light can transform the commonplace into the poetic and makes the real seem mystical and surreal. My approach to photography is simple. I value the unexpected and remain open to new ideas. I constantly explore new directions. The process of selection is undertaken in a meditative and contemplative fashion. I believe silence is vital to seeing. My image making is generally performed alone, working slowly, trusting my evaluation to my intuition. As instructor, my greatest challenge is to help participants see the world in new, active and deeply meaningful ways.